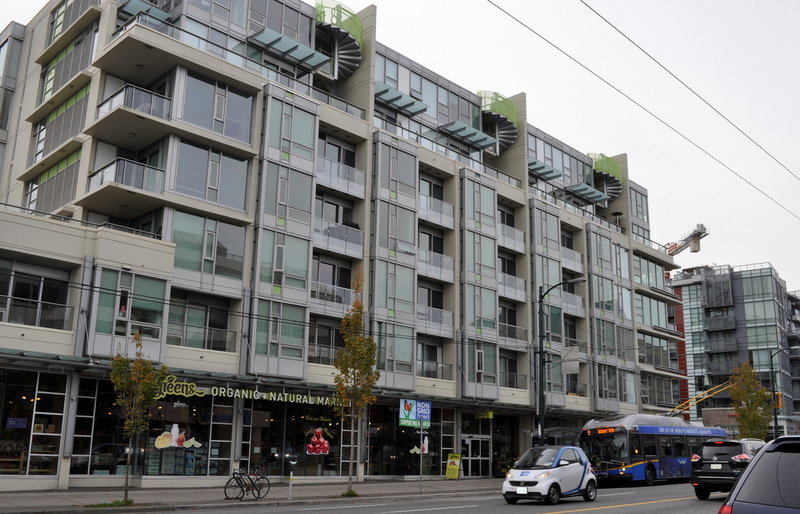 Recent medium-density housing, 10th Avenue near Ontario St.
Our previous post on the proposed Clark-to-Arbutus Skytrain extension was picked up by Price Tags, a definitive urban affairs site for the city of Vancouver. This generated a number of messages to Fraseropolis.com, including the following from MB, who supports a Broadway Avenue project rather than the 10th Avenue dig that was contemplated in our report. I have transposed one sentence for clarity, and added a couple of editorial notes. The 10th Ave alignment has many challenges related to the disruption of an old, established community. I suggest severely disrupting resident’s lives over 25 blocks for cut and cover would have a much greater political pushback than disrupting traffic on Broadway. Using C&C on non-arterials in historic neighbourhoods is engineering from the Dark Ages. 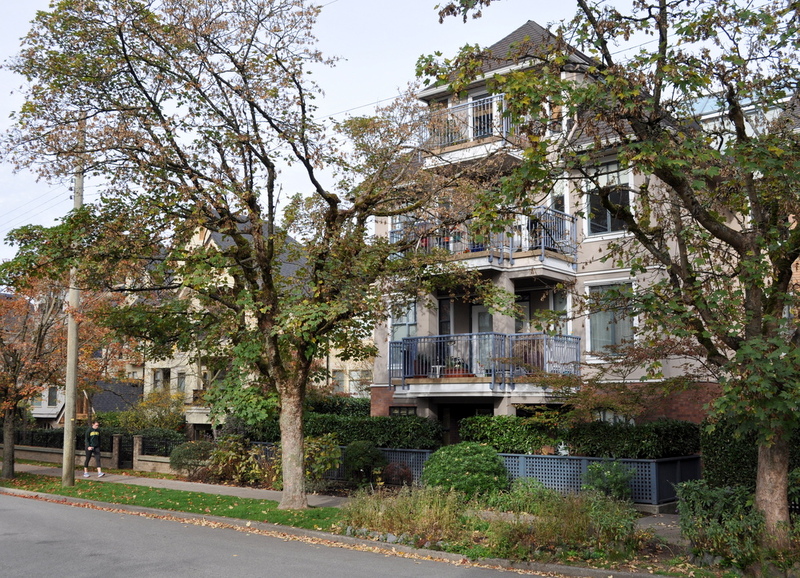 A designated heritage residence on 10th Ave.
My old residence faces directly onto 10th Ave with zero setback and is one of several 100+ year old unreinforced brick structures facing 10th. Opening the road even for a narrow double decker tunnel will likely destabilize and crack the structure. 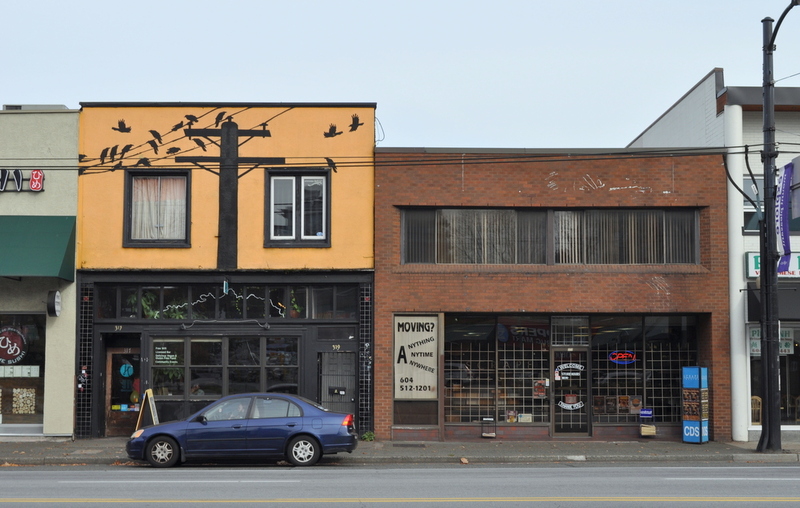 It and the majority of other Mount Pleasant buildings originate from Vancouver’s first streetcar neighbourhoods and predate the zoning bylaw by almost a half century, therefore they do not have parking facilities. Not one single family residence exists for almost the entire route.Thus the adjacent streets will become even more crammed than they already are. There are mature trees on just about every block that will be cut down. 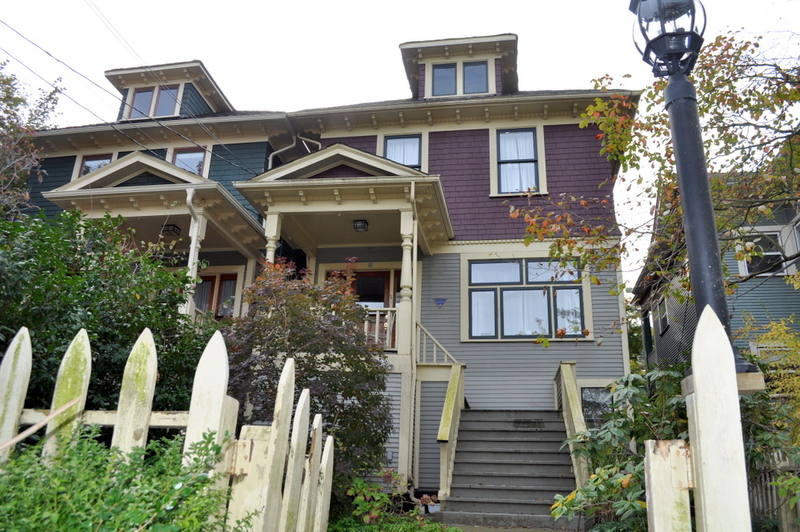 Council has already had a taste of neighbourhood reaction in communities like Mount Pleasant from the reaction to the nearby Rize development, and in Grandview over the planning process. Vision [Mayor Robertson’s municipal party] almost lost the last election over development impacts in Grandview, and barely saved their political skins by first apologizing, then slowing down and putting the entire planning process into the hands of residents through a Citizen’s Assembly. Let’s hope they respect that process, and respect residents in other established neighbourhoods when the Broadway Line is finally built. We need to learn from the two-year open trench warfare that occurred during the construction of the Canada Line, which is a cheap, below-average yet effective subway. Because there will be a design life of the 100+ years, and because it [the Arbutus extension] will generate significant revenue and receive very high passenger counts through several interconnected regional-scale transit networks and realize a profit after a few years, they can afford another $40 million per kilometre for full tunnel boring. TBMs do not disrupt the surface except at their entry and exit points, and in fact are almost forgettable after they enter the earth. Stations are another story, but the open station boxes we witnessed with the Canada Line [during construction] must be avoided and should be covered with steel bridges and plates, therein allowing at least two lanes in each direction to move for at least commercial, service and transit vehicles. Purchasing adjacent properties at some station locations will allow the contractors to remove and deliver materials and equipment sideways instead of up or down from the road surface. The properties could be developed by the city, transit authority, senior government agency or the private sector (who will pay a surcharge for direct access) to help defray construction costs. Taking a national approach could mean sharing the costs of projects between cities via large construction contracts managed by the feds (e.g. splitting the cost of big ticket items like TBMs to be used several times in several projects; grouping projects together in single multiple-part tenders and giving private consortiums more time than average to sharpen their pencils and compete amongst themselves; obtaining deep discounts on unit prices through bulk national procurement orders; taking mandatory contracted Canadian manufacturing and construction jobs to an above-average level; having serious power to negotiate significant public side benefits from private contractors, etc.). Under no circumstances should we resort to the discredited ideology of P3s and privatization of public amenities and services. Anyone who says you cannot physically build a subway and stations on the Broadway Corridor had their eyes closed when they built two stations on Granville Street, which is 6m narrower. When you build such an effective transit asset you can afford to use the outside parking lanes for station access from both sides of the street (i.e. two points of access/egress to the platforms instead of one), to expand the sidewalks at stations to afford exemplary pedestrian access and universal accessibility. The station platforms should be at least 120m long to accommodate future growth. Further, building this amenity could also remove enough cars to be able to free up thousands of m2 of land locked up in street parking to greatly improve the human experience of the pedestrian realm with high-quality and attractive treatment with great station architecture, and high quality urban design treatments using trees, lighting, fountains, generous seating, special paving, art, signalized mid-block crossings in the densest sections, and bus stop bulges. Much of the remaining parking lanes could be devoted to commercial loading and car share locations while keeping some parking. The subway combined with an enhanced Number Nine trolley service will provide a great balance between fast and highly frequent regional and slower local service, and therein offer an orders-of-magnitude increase in service quality. Regarding the capacity of the Canada Line, I believe it has plenty of room to grow by adding the third car, increasing frequencies, and reorienting the seats in the middle sections of the cars to run a continuous bench parallel to the walls and windows, like SkyTrain and a number of other metro systems. Now if we can find out what it would cost to buy out the private operator’s contract …..
Fraseropolis.com comment: The response above is built on the assumption that Vancouver City Hall makes the key decisions on rapid transit. This has never been true at any time in British Columbia’s history. Transit has been operated since 1999 by the South Coast British Columbia Transportation Authority, a pseudo-regional body that is controlled in effect by the provincial government. Three quarters of the region’s residents live outside the city of Vancouver. In taxpaying terms, outlanders would pay the same share as MB for the construction of the10th Street/Broadway line. In the run-up to the 2015 transportation funding referendum, regional mayors pointed out that more than 50 per cent of bus riders on Vancouver’s Broadway Avenue come from cities to the east of the big city. Fraseropolis will advocate for careful public deliberation around any development decision; in this case the process needs to take account of regional as well as neighbourhood interests. Thank you for posting this, and your response. One of the key points above is the potentially greater presence of the federal government in transit projects across the nation. The new government is about to put a lot more resources into this crucial infrastructure than we’ve seen a long time. Therefore, there is greater potential form federal influence over such projects, especially when it dovetails with their other policies on climate change. The province does have the superior poker hand at present, especially over cities which in some respects it enjoys bullying. But a much stronger federal player just appeared at the table with a bigger pile of chips and a motivation indicating a much higher respect for cities. The province needs to pay attention and adjust its attitude accordingly.